Well, we've had quite the busy and crazy weekend and it all started with this little bugger from McDonald's. My wife saw it was just a dollar and figured I should give it and try. It's a good thing she did, because it's actually quite tasty. That's right, no complaints here. It's a sweet (non-tart) yogurt mixed with fresh berries (mostly strawberries) and some granola (the green baggie behind the cup). I had a few non-mixed bites to test the components and once realizing they were all decent, I did my mixing thing and quickly scarfed this 120 calorie treat. I have no problems recommending this to everyone. In exchange for working all last weekend, my new company graciously gave me two days off in exchange. Hmmm, I sure could use a long weekend, and it was made so. We had an appt in the morning to take care of, but the rest of the day was ours, so we headed out to see the final piece of the Harry Potter Puzzle. Like many critics have said, it's good, but there is ALOT of talking. In a way it felt more like a clip show then a finale, but we still enjoyed it overall.... ofcourse our enjoyment was helped by some horribly unhealthy yet fantastically tasty Ben & Jerry's milkshakes. So it's a thousand plus calories of super awesome creaminess, but it's not like I do it more than once or twice a year. My wife went with cookie dough again, but I went with Sweet Cream & Cookies and oh my expecto patronum was it good. So cold, so rich, so sweet, so magically perfect. It's so hard for me not to chug these things down. You know, if I haven't convinced you to try a B&J milkshake by now then apparently I'm doing a terrible job of blogging. Oh, and just for the record, I don't recommend Glow Golf to anyone over the age of 4. It was $18 for the two of us to play 36 holes. I was good after about 9 holes (which explains those places that only offer nine). It's a novelty that gets boring really quickly. Look, I take mini golf very seriously ever since my golfer mom started taking me as a kid. The whole thing was immensely repetive because there are no curves or long shots, it's all just right angles. the "grass" doesnt glow, so there is no difference between it and the floor. 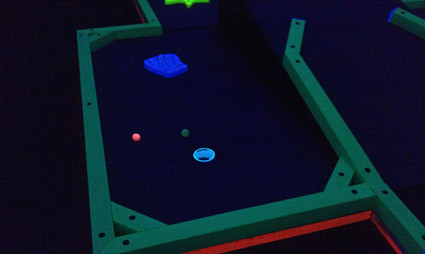 In fact, the putter doesn't glow either, only the balls and the walls do. I can't tell you which hole this is because they all blurred together (especially the second set of 18 holes). I get the benefit of doing something indoors with air conditioning during the hot hot summer, but even then, this place was nearly desserted (though it was dinner time). After awhile, the black lights started messing with my mind and everything was looking hazy. Look, I love the outdoors and I love mini golf... I love the breeze hitting me as I line up my next shot, or gazing around at a whatever whacky waterfall or contrapation has been built infront of me, but this was just boring. I will admit that true Monster Mini Golf is probably more exciting, but even then, Friday's experience has soured me to the whole indoor golfing craze. Ok, until tomorrow's tasty (and crunchy) review. The yogurt parfait isn't new. It has actually been around for at least 4 years now. These aren't new are they? Or was something about them changed? sorry, my massive apologies, I literally haven't stepped into a McDonald's in... it was a few years ago, and that was the first time in like a half decade or so. 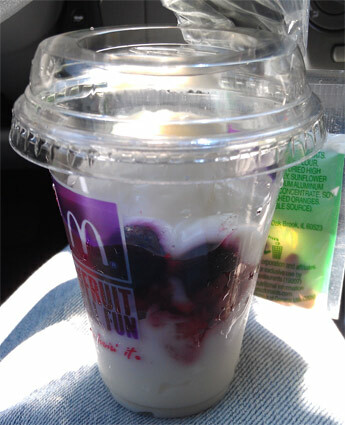 with the whole parfait bandwagon, I just assumed it was new, though usually I check these details first. Yeah, the parfaits have been around for quite a while and are a favorite of mine. Although, when I saw you had listed them as "new", I was beginning to think you lived on Mars or something. LOL. @IE: yeah, I feel kind of silly for saying it, but at the same time, I can't help but recommend trying it. i will be staying around for sure :D!